United Methodists are committed to health, wholeness, and offering hope. 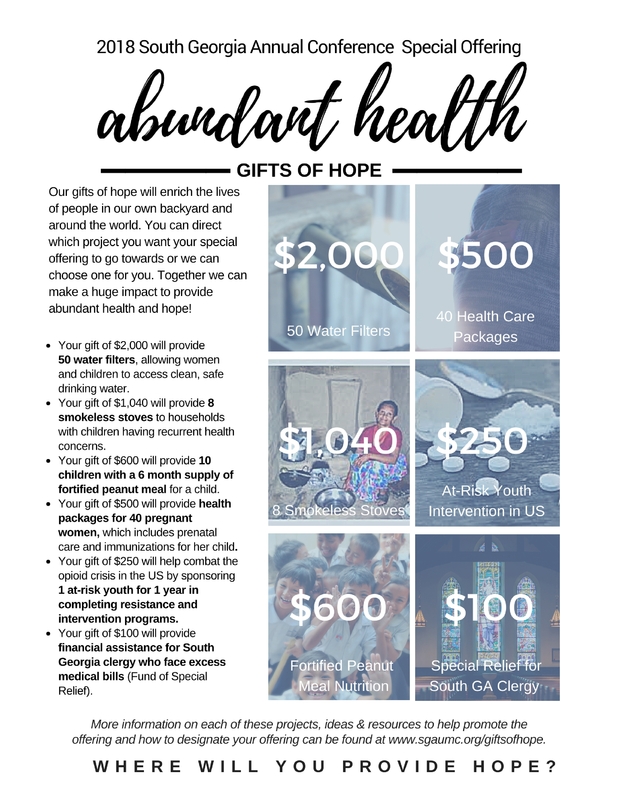 During this year’s Annual Conference session, South Georgia United Methodists have the opportunity to give gifts of hope to enrich the health and lives of people in South Georgia, the United States, and around the world. Givers may choose to designate their gifts to one or more projects (see below), or they may leave them undesignated and the Conference will divide the funds between the Abundant Health Advance #3021770 and the Special Relief Fund for South Georgia Clergy. The 2018 Annual Conference Special Offering is in partnership with Global Ministries’ Global Health focus of extending health interventions to one million children by 2020. Learn more about the Abundant Health Initiative and ways a local church can partner with Global Ministries in mission and ministry from “Everywhere to Everywhere” by visiting http://www.umcabundanthealth.org. The Special Offering given by local churches from all across South Georgia will be collected during the Opening Worship Service on Sunday, June 3. Checks can be made to the South Georgia Conference. Download the Offering Designation Form to choose your project(s) here. Please attach this form along with your check (made payable to the South Georgia Conference). Where Will You Provide Hope? If you choose one of the first five projects below your special offering will help support supports worldwide healing is through Global Ministries' focus of extending health interventions to one million children by 2020. The sixth project, the Fund of Special Relief, will help meet the needs of our clergy right here in South Georgia. Click here for FAQ's about the special offering. THANK YOU FOR SPREADING HOPE! Your gift of $2,000 will provide 50 water filters, allowing women and children to access clean, safe drinking water. One region benefitting from this focus is Guatemala, which has the poorest health outcomes in Latin America. The most common cause of child morbidity are respiratory infections and diarrheal disease. Access to clean water and educational programs provided through partners are expanding to reach 2000 women and children with water filters and other basic tools to promote abundant health. Your gift of $1,040 will provide 8 smokeless stoves to households with children having recurrent health concerns. This simple technology does so much for a family. Smokeless cook stoves replace open indoor cooking fires and use less wood for fuel, reducing cooking time and eliminating dangerous smoke from homes. Giving a families a cleaner, healthier home. Your gift of $600 will provide 10 children with a six month course of fortified peanut meal nutrition. The fortified peanut butter-like paste contains fats, dietary fiber, carbohydrates, proteins, vitamins and minerals. It also provides calories and essential nutrients that restore and maintain body weight and health in severely malnourished children. Your gift of $500 will provide health packages for 40 pregnant women which includes prenatal care and immunizations for children. One area that is currently being served through this initiative is the Democratic of the Congo. This region has one of the highest maternal and under-five mortality rates in the world. Global Ministries partnerships are providing immunizations, prenatal care, bed nets, test kits and treatment for malaria, pneumonia and diarrhea. Services in this region are being expanded to 3 additional villages to serve 8000 children. Your gift of $250 will help combat the opioid crisis in the United States by sponsoring 1 at-risk youth for 1 year to complete resistance and intervention programs. Youth intervention programs, right here in the United States, are targeting middle school and high school students identified to be at-risk for substance abuse, educational failure and other challenges. Programs are teaching life skills, social and drug resistance through after school and summer programs. Individual and group counseling by mentors are also a key component to invest in the lives of these youth. Your gift of $100 will provide financial assistance for South Georgia clergy who face excess medical bills through the Fund of Special Relief. The Fund of Special Relief has been around since 1830, assisting clergy in our Conference when they are faced with special needs, such as unforeseen medical bills. A small committee is able to provide confidential aid when the need arises. This fund provides a tangible expression of caring for those who serve us. 1 - When do we turn in our offering? The special offering will be collected at the opening worship service of the 2018 Annual Conference Session on Sunday, June 3. 2 - What if we don't collect an exact amount or fund the entire amount for one of the projects listed? Give what you can! You can still designate which project(s) you want the offering to go towards and we will add it to other churches' offering that have chosen that same project. That's the beauty of the connection! 3 - What if we want to give to more than one project? Great idea! Just indicate on the Offering Designation Form which projects you want to divide the money between. 4 - How does our church designate which project we want our offering to go towards? Simply download the Offering Designation Form to choose your project(s) and include it with your check (made out to the South Georgia Conference) that your pastor or lay member to Annual Conference brings the money to Annual Conference. 5 - What if our church doesn't designate a particular project? No worries! We will take your funds and divide it between the Abundant Health Advance #3021770 and the Special Relief Fund for South Georgia Clergy. 6 - Do I have to complete a form? No form, no problem. If no form is included with the offering we will assume you are graciously giving your offering to be divided between the Abundant Health Advance #3021770 and the Special Relief Fund for South Georgia Clergy. 7 - What if our church receives donations after Annual Conference? Great! The more, the merrier. Simply attach a copy of the Offering Designation Form with a check and mail to our Conference Treasurer: Administrative Services, PO Box 13145, Macon, Georgia 31208. If mailed without the form, the funds will be divided between the Abundant Health Advance #3021770 and the Special Relief Fund for South Georgia Clergy. 8 - Who do I make the check out to? Make the check out to the South Georgia Conference.